Oscilloscopes find critical use in various industries, which creates a huge demand in the market. Major part of this demand is fulfilled by our team of experts by procuring quality products from reliable vendors. These Oscilloscope are tested before the procurement and are procured in bulk quantities. 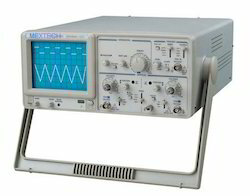 All the oscilloscope can be availed by the clients at market leading prices. We are providing a excellent quality of Digital Oscilloscopes OS5030 which is now the preferred type for most industrial applications. Instead of storage-type cathode ray tubes, DSOs use digital memory, which can store data as long as required without degradation. A digital storage oscilloscope also allows complex processing of the signal by high-speed digital signal processing circuits. It's advantage are brighter and bigger display with color to distinguish multiple traces as well as equivalent time sampling and averaging across consecutive samples or scans lead to higher resolution down to µV.